Greetings, furriends, it’s Padre here. Yesterday morning, I overheard Mom calling the V-E-T about an appointment for me! 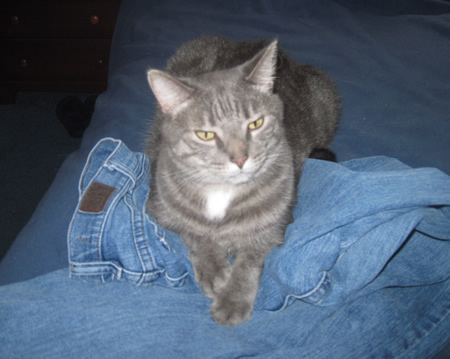 When I could tell that Mom was in getting ready to leave the house mode, I tried a clever delay tactic by sitting on the clothes that she had placed on the bed to wear. Alas, it did not stop her from picking me up against my will and forcibly placing me into the PTU! Immediately I voiced my complaints, which were ignored. As it turned out, Caramel was already in another PTU. Mom and Dad then took us to the grey room that moves, and then we left the safety of home! 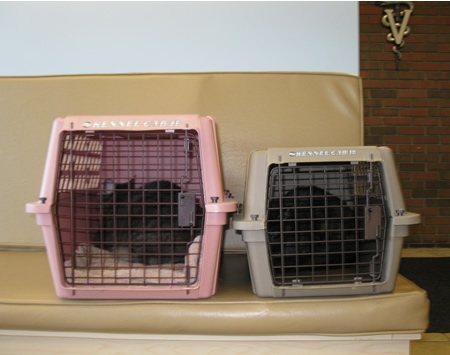 As expected, we wound up at the V-E-T. Here we are in the waiting room on the bench. Mom is upset that I have been horking up my foods lately. Doesn’t she know this is part of the Cat Code of Ethics to hork up one’s food on a regular basis? Methinks she worries too much. Well, I tried the technique of trying to make myself as small as possible, maybe even invisible, as not to be seen, by facing the rear corner of the PTU. No such luck. They found me and pulled me out. My weight is the same as always, 13.0 pounds, a good weight for a medium sized mancat like myself. See, no cause for concern! Dr. Amy decided I have some tooth problems, but those will be addressed at another time. (I hope that Mom forgets about that.) Dr. Amy took me to a back room where I was stabbed in the back! You just can’t trust these V-E-T’s! She said they gave me fluids because I was dehydrated. Hmpf! Why didn’t she just offer me a drink? Nooooo, they stab you in the back. And she gave me two shots! I was returned to the PTU, and then Caramel was given the business. Just in case they had ideas of pulling me out again, I went back into hiding. When we got home, I was quite relieved to be out of that PTU. However, we weren’t home long before Mom announced to Dad to “grab Padre”! Yikes! Dad held me while Mom shoved some vile tasting liquid down my throat! Caramel had a horrible experience as well, but I will let her tell you about it herself in her own post. 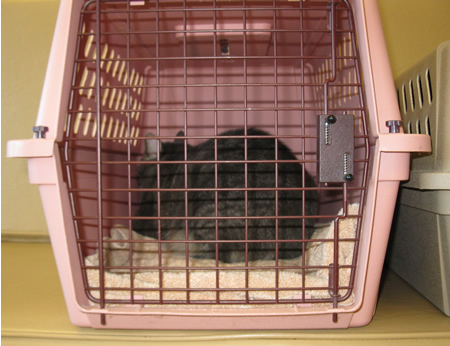 Filed by Padre on Sep 4th, 2010 under Padre's Posts, Tormenting, V-E-T. Leave a Purr or Hiss. Awww, Padre, you poor sweeties, both you and Caramel. Did the vet take blood? Has your mom got the results yet? Lots of purrs and healing Light to you both, that all will be well. *Kitty kisses* to you both! ACK! What a terrible day. 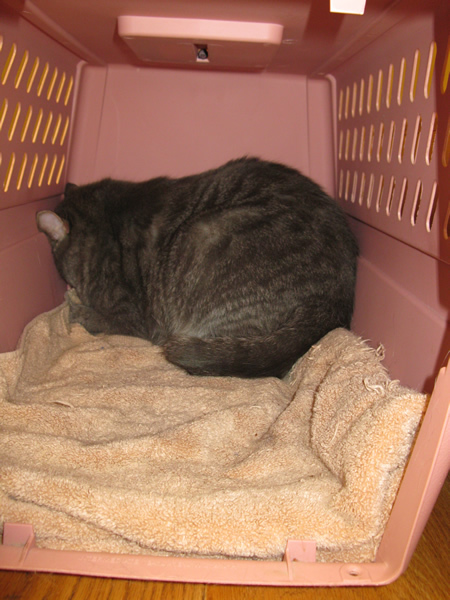 We try the invisibility thing, too…we think the Evil Vet has special powers to see through the invisibility barrier. Rats! And then the vile medicine. That is so unfair. Two of you got terrible treatment in one day? What was it, stab your kitties in the back day? We are glad you both survived such horrors and are safely home. Now, no more barfing or you’ll be dragged back to the vet again. Take your med too. Oh dear, that sounds like lots and lots of terrible tortures! I hope you are feeling better soon! Padre, we sympathize with the indignities you underwent and endured, but it sounds as though they were necessary too. Sending keep-food-down vibes so you won’t need to go back for more of that treatment. Hi Padre! WE hope you are doing ok – we know how stressful those vet trips are! We don’t get the trip to the vet for horking up your food either – that is what cats do! Do you do it right after eating too fast – we do that sometimes at our house – mostly Kirzon, because he learned it from Floyd, who would eat so fast it was a blur! Most of us only hork when we have a hairball, and that isn’t too often (that is a Kirzon thing too), so mom doesn’t always take us for that (she does if it isn’t a food to fast or hairball though). And oh, that nasty liquid – we feel so bad for you! WE hope you start to keep everything down so they stop giving you the nasty stuff – and so you can get back to your favorite foods! We are sending over lots of purrs and prayers! !